Prime Minister Benjamin Netanyahu and his wife Sara surprised two Israeli children inviting them to join them in watching the World Cup semi-final match between England and Croatia in Moscow. The children – Mika Lipsker, 18, from Katzir, whom the Prime Minister and his wife have known for years, and Alon Eizarayev, 13, from Petah Tikva, who was born in Russia – have cancer, and will be accompanied by their parents. Prior to taking off for Moscow, Prime Minister Netanyahu said: “I am now leaving for Moscow for a very important meeting with Russian President Vladimir Putin. We will discuss Syria, Iran and Israel’s security needs. I very much appreciate the excellent direct connection, without intermediaries, between myself and the Russian President. It is very important for the national security of the State of Israel. After the meeting, my wife and I have been invited to watch the World Cup semi-final match and they told us that we could bring two guests. We decided to bring with us two wonderful children who are bravely fighting cancer: Mika, whom my wife and I have known for nine years, and Alon, whose parents emigrated from Russia and who likes soccer very much. We are very moved that we can realise a dream for them. 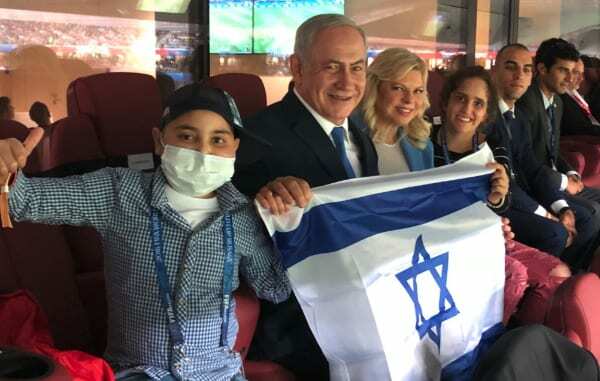 Prime Minister Benjamin Netanyahu and his wife Sara at the invitation of Russian President Vladimir Putin, at the World Cup semi-final match along with Mika Lipsker (18) and Alon Eizarayev (13), who are fighting cancer and whom they invited to the game.